Any blender will do, but… when your ready to get series about your blending, you are ready for a Vitamix. We are partnered directly with Vitamix. No matter which Vitamix blender you choose whether it be a new or reconditioned, you can rest assured you are getting one of the best high-performance blenders made for the home. You also get it for the best price with free shipping when ordering direct through our links. Vitamix has been producing blenders for over 70 years and have been leading the industry in reliability and durability. 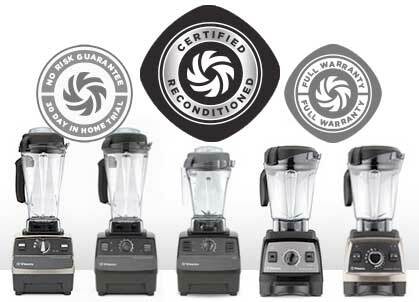 Made in the US, every blender comes with their unprecedented 7-year full use warranty. You have the opportunity to try a blender of your choice in your home. If you are curious or have interest, there is NO reason not to try a Vitamix. There are many Vitamix models to choose from. They are organized into 4 basic “groups”: C-Series Classic, G-Series Next Generation, S-Series Personal, and Reconditioned (discount blenders from all 3 Series). 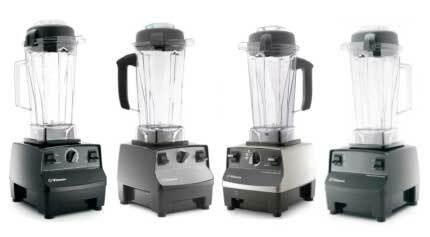 The classic 5200 and Professional 500 with pre-programmed blend cycles set the standard for true high-performance blenders. 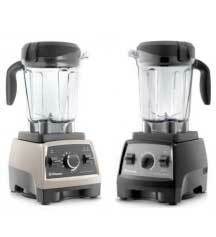 This series of blenders contains the largest number of models as well as the best selling models for the last 9 years. Taking blending to the next level, you can easily make smoothies, frozen desserts, dips, sauces, nut butters, and hot soup like the chefs. 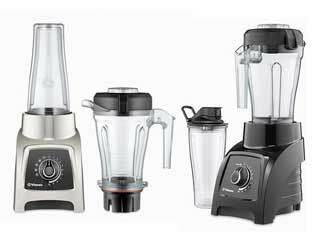 The Vitamix Next Generation 7500 and Professional 750 takes home power blending to the next level. This group of blenders touts the most advanced, fine-tuned blending features to date with a 40% reduction in sound level while blending, improved precision control, and low-profile 64oz blending containers. With their latest series blenders Vitamix has entered the smaller personal blending market. The Vitamix S-30 and S-55 continues to pack some series power for blending most anything, yet do it with a personal, travel minded touch. With a new container system based on the same tried and true technology, you can have the convenience of single-serve blend-and-go operation as well as small batch traditional power blending. Don’t let the price of a Vitamix deter you from purchase. You can save over $200 by choosing a reconditioned Vitamix. All refurbished Vitamix are Certified, fully guaranteed, and covered under the No-risk trial. These blenders are often a return or a demo that has never been used. They are all tested by hand in the US to ensure that they work LIKE NEW. If you are looking to save the most you can and still get the blender of your dreams you can’t go wrong with a reconditioned. To take advantage of free shipping discount and best price, you must use our links.